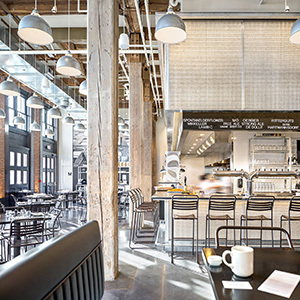 Stetson's at Hyatt Regency Chicago | Bentel & Bentel Architects/Planners A.I.A. STETSONS AT HYATT REGENCY CHICAGO, CHICAGO, IL- Our goal was to create a great steak house in which the simple quality of meats and produce impeccably prepared were matched by a clean, progressive interior whose materials offered both a calming note and carefully orchestrated visual harmony. The color palette is purposefully light and dark, a reflection of the menu which features fish and meat, but also as a conscious effort to create a space which appealed both to men and women, young and old. The space also opens directly to the lobby of the hotel. Its entry is visible across the space to the point at which guests enter as a gesture of invitation and hospitality. Visual axes were at least as important as the material surfaces – the lighted columns, the wine storage area, the bright flame at the center fireplace feature as well as the dramatic panelized metal ceiling which terminates at the rear of the restaurant in a vertical wall feature are each designed with the goal of drawing guests in to the space to partake of the food and the community.